Driver needs to stop stealing the storyline. >_< She was supposed to pop in and out the jerk. Last but not least – someone listed ‘Ship Tease’ for WaM on its TVTropes page. I am amused. Okay, aside from the greatness that the comic always exudes, getting the Mustang would be EPIC. It’s not a total coincedence. XD I named my first car after FMA’s Roy Mustang in the first place. YAASSS. You are officially on my book of awesome people! 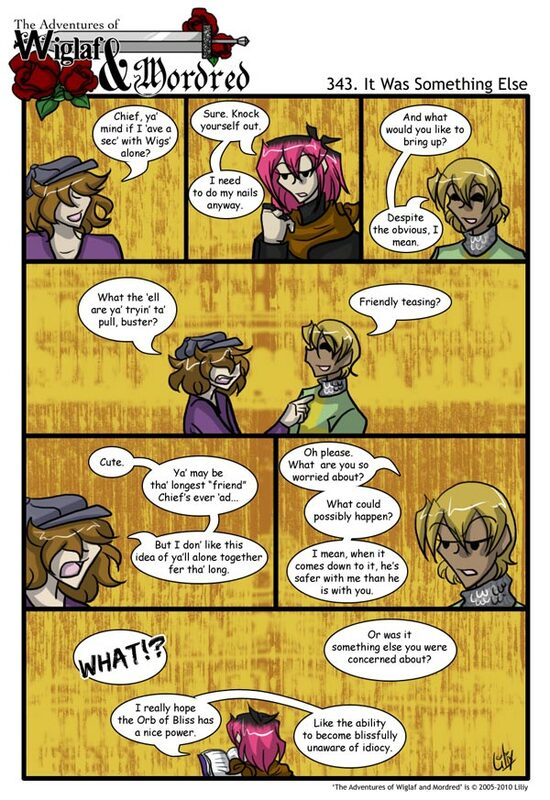 The last panel really makes me hug Mordred. And possibly give him a pair of noise blocking headphones. I hope the Orb of Bliss makes it rain kittens. That would be fairly entertaining, and could make for a fun supervillian sort of speach. And I’m quite alright with Driver sticking around more! She and Wiglaf go well together. She can’t give Arthur play by play specifics. :P That’s a huge benefit right there. I just imagined Driver following Wiglaf and Mordred dressed like a bush and narrating the events to Arthur over her cell phone. Hmmm… the promise was no new characters for this arc, so we probably won’t get to see any scenes from Driver’s visit. That’s a shame– she’d look good chewing the walls in frantic frustration. Liliy, you opened this arc with a focused look at Azrael and Grace. Does this mean the Orb of Bliss has something to do with Grace? Has the name “Orb of Bliss” actually been shortened from the name “Orb of Bliss-to-the-Bearer-of-the-Haunted-Sword”? Or is this Orb of Bliss actually something that has a mirror-image– oof. No, you didn’t. That Rabbit was a blatant hint, wasn’t it? Does this Orb have something to do with that line from Thomas Gray’s “Ode on a Distant Prospect of Eton College”? *Shakes a finger at Liliy. * You’re crafty.